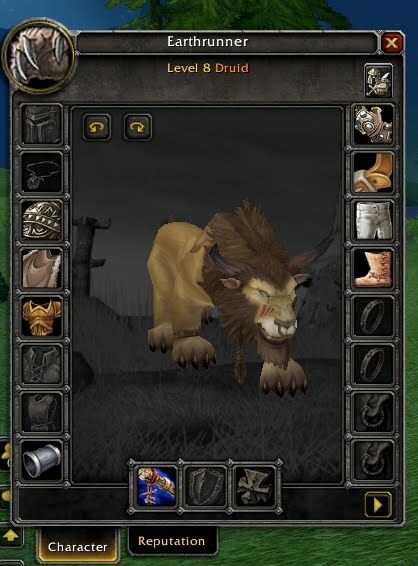 I just wanted to see this for myself, cat-drood is fur fite, at level 8. So off I went through Mulgore. Casting Wraths along the way, I again encountered the most annoying thing of low levels, no bag space. I had to return a lot to sell stuff. But even all that selling was not enough. There's a little problem with druids. They can get the ability to become a cat at lvl8, and have to learn cat-form, and 3 new spells, all costing 3 silver and 70 copper. Now don't look at it with the eyes as a lvl80 with to much gold. If I hadn't had Gowron transferred to the PTR, I would not have had enough silver to buy all the sweet kitty-stuff. New players will not have the backing of gold, and I am seeing frustration because they can't get the spells. Yes, of course, you could get out and start killing stuff.... but it isn't fun, and confusing for new players. And there is more confusing stuff coming, but luckily I did had gold-backing. Ok, one good thing are thew tooltips. 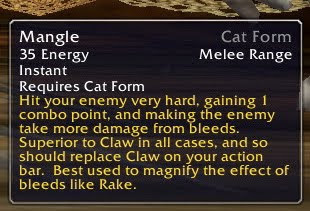 Below is the one for mangle, which you get for free if you choose to go feral. Very clear what to do with this spell. So, now I think it's time for some dual-wielding totem-thrower.